Obama Fiddles While The West Burns! And, OBAMA FIXES FIRE PLANE CRISIS …….. NEXT YEAR! 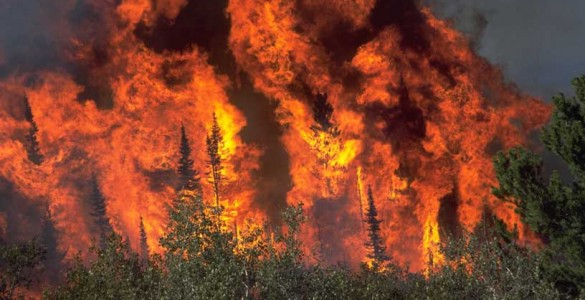 As I’m sure most of you are aware, the last few years the annual forest fires which occur during this part of the year is being more and more publicized. Climate nuts have used these fires for propaganda points for the past few years. As the news would have it, they seem to be intensifying. As I was making my rounds, I was reading one of my favorite writers, Michelle Malkin. Now, even though she’s one of my favs, I understand she’s a bit partisan. So, I do a little more snooping to see what I can find out. Here’s what we know. The U.S. used to have a fairly large firefighting air force at its disposal. A total of at least 44 planes available 8 years ago. The fleet has been diminishing ever since. Today we’re down to 9. Last year, in the middle of the fire season, while Rick Perry was still campaigning, the Forest Service simply terminated a contract with a company called Aero Union. Aero Union had operated 6 Lockheed P-3 Orions, and was preparing to add a seventh to the fleet when the contract was canceled. Originally, the Forest Service stated that it was a safety issue. “Our main priority is protecting and saving lives, and we can’t in good conscience maintain an aviation contract where we feel lives may be put at risk due to inadequate safety practices,” said Tom Harbour, director of the Forest Services fire and aviation management program. However, they weren’t on the same page as the FAA. “The [Federal Aviation Administration] representative stated that the disrupted contract issues which led to the grounding of Aero Union’s entire fleet do not relate to the suitability of these aircraft to perform for the remainder of this fire season,” [California GOP Rep. Dan] Lungren said in the Aug. 15 letter to Agriculture Secretary Tom Vilsack, whose agency oversees the Forest Service. Oops, caught in a lie. Both the U.S. Government Accountability Office and the Department of Agriculture’s Inspector General have been critical of the Forest Service’s handling of the matter. The fleet shrinking had been known to the Obama administration since it took the reins in 2009. For their part, Aero Union doesn’t know why their contract was cancelled either. “We wanted to sit down with them and ask why it was canceled and find a quick resolution, but they didn’t want to talk about it. They just said, ‘We don’t want the airplanes, have a nice life,’ ” Gourley said. I do love the transparency of this administration. Nine months after Lungren’s warning, the deadly High Park fire in Larimer County, Colo., claimed a grandmother’s life, destroyed 189 homes and scorched nearly 60,000 acres. Arizona, New Mexico, Washington and Wyoming also have battled infernos this summer. After months of dire red flags from a diverse group of politicians ranging from Texas GOP Gov. Rick Perry and Arizona GOP Sen. Jon Kyl to Oregon Democratic Sen. Ron Wyden and New Mexico Democratic Sen. Jeff Bingaman, President Obama finally signed emergency legislation last week to expedite the contracting process. Obama will borrow planes from Canada and provide $24 million for new aerial tanker contracts. But the money won’t come until next year,……. Now this has to be deliberate. We’ve got governors, congressmen, senators all from both sides of the aisle screaming that we need more planes to fight the fires. They’ve been screaming this for nearly a year, and, nothing. Finally forced to do something, we’re going to get 2 planes from Canada, next year! This is the same guy who argues that we need to hire more firefighters. Well here’s money which was already budgeted for just such purposes and what happens? “I had to let go of my staff–60 people and their families were devastated,” Gourley said. “It’s really been tragic.” “This is our 50th anniversary fighting fires for the Forest Service. It’s not quite the way we wanted to celebrate it,” Gourley said. Logistically, there’s not enough planes to go around. So, the question is why? Why? Well, we can’t know the answer to this, because the administration and the forest service have shown that they will not be honest with the American public. So, it is left to supposition, for now. There’s absolutely no way I’m going to believe the administration cares about the $24 million, that’s such a miniscule amount compared to what they piss away on a daily basis, so, fiscal restraint is precluded as a reason. Why is it that I have the words, “Never let a serious crisis go to waste” echoing in my head? Is the administration trying to create these crisis’? Was this an attempt to aid the eco-nuts? Is it because rural America is conservative? Is that the impetus of gutting our aerial fire fighting fleet? Is there something we can attribute these aggressive actions which wouldn’t be for nefarious reasons? 15 Responses to Obama Fiddles While The West Burns! Yeh, their depths of malicious stupidity knows no bounds. Did they consider using an aquarium? Cancelling the contract with Gourley to later make a different contract with the Canadians means somebody earned himself a nice kickback. Somebody who learned from Rahm Emmanuel, Never Let A Crisis Go To Waste. Andn why not create a crisis to have something you don’t want to let go to waste? I have similar suspicions about the entirety of the European political caste. Exactly. these political games with the people’s money has gotten so extreme these days. It’s as if this crap is simply accepted now. A few months before the Great One’s election to office, chatting with a (black) american friend, I jokingly referred to his Omnipotence as Obama bin Laden, and instantly regretted it, as I saw the look on his Democratic face. Time has increased my knowledge of the Great Procrastinator and his weapons of mass economic destruction, and I wouldn’t regret making the same comment now; I’d defend it. He’s done more damage to his adopted country than Osama could have hoped in his wildest dreams to have achieved. Yeh, I was one willing to give him a chance……that lasted about 2 days. Today, nobody is monitoring the temp above the oceans, 2/3 of the planet’s surface area… in -between monitoring places on land 99,9999% of the area, nobody is monitoring = nobody knows what was the planet’s temp last year, to save his life… the Fake Skeptics ”pretend to know exact temp on the WHOLE planet for 1234AD… That was 500years before Cook discovered Australia.. 600years before first man went to Antarctic; please guys, stop blaming the Warmist; they are lying for cash; what are the Skeptics lying for?! Well, this wasn’t really about CO2, but, you’re right. No one knows what the global temp is today, much less what it was 500 years ago. But, I do understand that there are people looking at the temps of the oceans today. http://www.argo.ucsd.edu/ But, I’m not sure what that would tell us. suyts, monitoring the sea surface temp is very important for rainfall / for meteorologist. BUT, ones they include ”GLOBAL warming” with it; that’s the con part. It’s same trick as: ”the moon is spinning around the earth and you own me a million dollars. When are you going to start paying?! What, what; isn’t the moon spinning around the earth”? They use the cheapest tricks; it only works, because of, most of the active into climate, are big city slickers; cannot understand that H2O controls the climate, not CO2. Heat stored in the oceans, in the volcanoes, in your oven, in the plutonium (kaboom) only becomes part of the global temp, when is released into the air / troposphere. Taking the ocean heat as GLOBAL temp; is no different than taking in the account; the heat in the magma, in the center of the earth. It only becomes part of the global temp, when is released out of the volcano / or the ocean / from your oven – when that happens -> troposphere expands the speed of a bullet – same like enlarging the size of your car radiator; every time when the engine gets warmer. Only, where the troposphere expands upwards – is much colder, than on your street. trick, so they see that you know what they are really doing = they become impotent.